This is one of those cases that we are very proud of. Now don’t get me wrong and think that we don’t enjoy helping people with back pain, sciatica, neck pain, and headaches but this case here shows what chiropractic care can and what it was meant to do, and we are honored and humbled to have been chosen to serve this little girl’s needs. Her mother brought her 6 year-old daughter in out of desperation and was visible upset that her little girl was sick and nothing was helping her. A friend of hers suggested she take her to see a chiropractor and she found out I’m currently one of the few chiropractors that is certified by the Academy Council of Chiropractic Pediatrics within 25 miles of Belvidere, New Jersey. Ever since she was born she couldn’t feel it when her bladder got full and she would continually wet herself and required a diaper even up to her current age. As she was in the first grade this was obviously a concern. Not only that but an even bigger concern was she constantly had urinary tract infections from the improper emptying of her bladder and she couldn’t tell when or if she had an infection, since she had no sensation, and needed to be continually checked by her pediatrician to see if she had one and was constantly put on antibiotics. He sent her to a pediatric urologist who did a bunch of tests that only showed that her bladder wall was thickened and diagnosed her with a ‘desensitized bladder’. 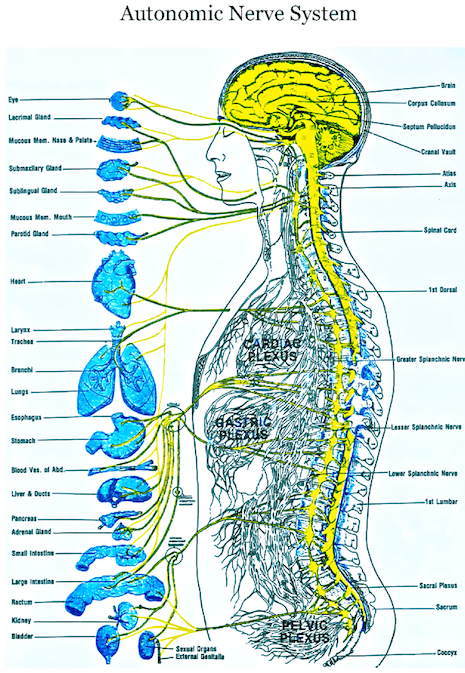 As you can see from the anatomical chart above, the sympathetic nerves (green) to the bladder exit the spine from the upper part of the lower back (lumbars) and the parasympathetic nerves (yellow) exit from the tail bone (sacrum). 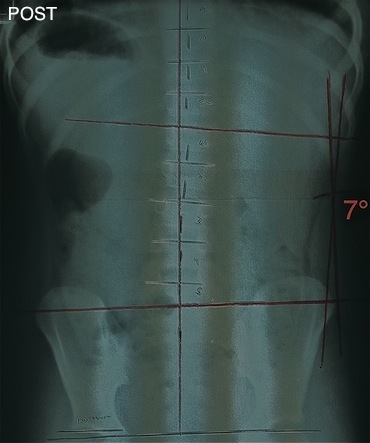 Upon examining her spine I felt tenderness, muscle tension, swelling, and joint fixations at these areas and then took X-rays of her lower back to see what exactly was going on and eliminate any guess work. Which you can see below. 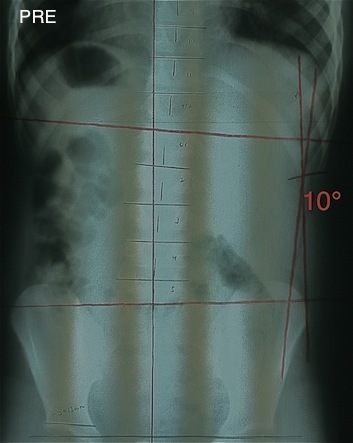 As you can see from the picture on your left (which is the view of her lower back from the front) that she had a scoliosis measuring 10 degrees with obvious misalignments in the upper lumbars (where most of the curvature is) and also in her pelvis and tail bone. 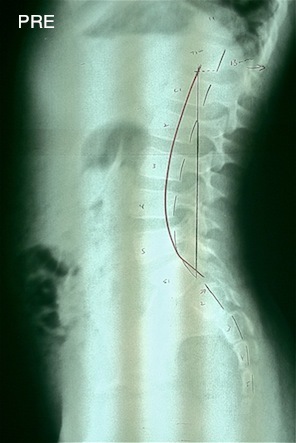 The picture on your right (which is the view of her lower back from the side) you can clearly see that she also has an increased in the normal curvature (red line), and her tail bone (which at this age is normally still 5 separate bones until fusing sometime during puberty) had obvious misalignments. 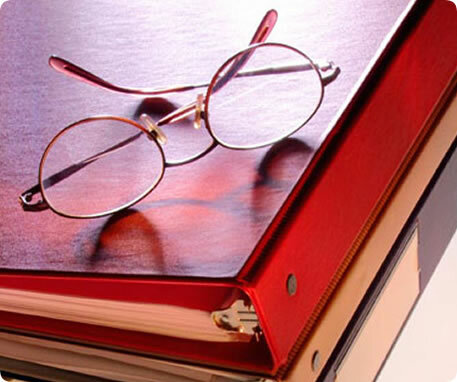 Which ultimately was causing pressure on all the nerves going to her bladder, kidneys, colon and reproductive organs. Once I found out exactly what was causing the problem and exactly what condition her spine was in and after a successful test adjustment (to find out if we could even correct what was causing the problem) I was confident we could help her and put her on a treatment plan which included a set schedule of chiropractic adjustments. After treating her 3 times a week for 2 weeks the 2 times a week for 2 more weeks we stopped and took another look and some progress films to see what if anything had changed. Which you can see below to the right next to her initial films for comparison. 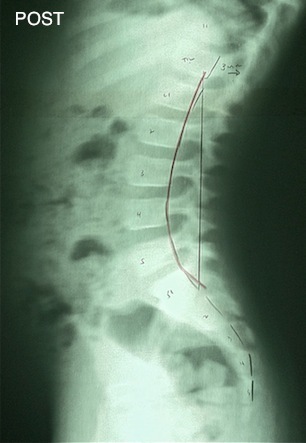 As you can see, the scoliosis came down to 8 degrees as well as a significant improvement in the side curve toward normal (red line) and some decrease in the misalignments of the 3rd and 4th sacral segments. However, no noticeable change in her symptoms occurred. We continued her treatment as planned 2 times a week for 4 more weeks. Then, two visits before her next scheduled re-exam, I asked, if they noticed any changes? At which point, her mother smiled and reported that: “When they where out at dinner the other night, she said, Mommy I have to go to the bathroom.” Her mother was shocked as she has never heard her say that. So then asked, “You mean you have to pee?” She answered, “Yes” so her mom naturally cried and as she told me all this cried again, meanwhile her daughter just kept on smiling. After her scheduled re-exam, we then gave her a few specific stretches and exercises to do at home for her scoliosis which you can see HERE and continued to see her once a week for 4 more weeks to keep her spine in alignment while she stabilized it. Following those 4 weeks she was re-examined and we took more x-rays (to see if we accomplished what we need to). Which you can see below to the right next to her initial ones again for a comparison. 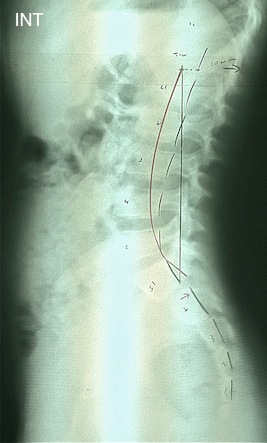 As you can see, the scoliosis came down even further to 7 degrees as well as the side curve improved to normal (red line), and all 5 sacral segments are in perfect alignment. She now has complete feeling and functioning of her bladder, hasn’t had a UTI in 2 months, and no longer wears a diaper. More importantly, what if her mother’s friend didn’t suggest she see a chiropractor and she didn’t come see me? I don’t doubt that her body would’ve adapted and she would’ve eventually ‘out grown’ her symptoms (especially once her sacrum fused but in an abnormal position). 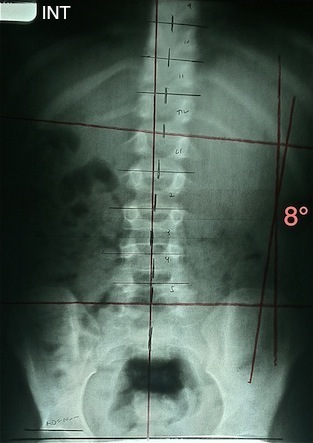 Her scoliosis would’ve progressed until bone maturity, she’d more then likely would’ve eventually developed kidney, digestive, menstrual and reproductive problems, and as she aged, eventually would’ve developed degenerative disc and joint disease. Remember, it’s not what proper chiropractic care can do for you that’s important, it’s what proper chiropractic care can save you, your children, and your children’s children from. With that, if you or someone you know at any age (in fact the earlier the better) has never had their spine checked to see if they have a chiropractic condition or not definitely should. Since, the earlier it is found the easier it will be to correct it. If you live or work anywhere near our office, located in Belvidere New Jersey, I’d be honored to check you myself, in fact if you click the Free Health Report link above you’ll be taken to a special page where you can enter your name and e-mail address (you can unsubscribe at any time) and get your free report that includes an offer of incredible value for your initial visit to our office to find out if we can or can’t help you.